Here's a product that we really like, and is even in use in our own fleet. Any salesman or contractor that spends any amount of time in their work vehicle knows it's a matter of time before papers, pens, chargers and other similar gear starts to accumulate. When you get to that point, it really gets hard to keep track of things that matter (receipts, invoices, etc.). This is where the "mobile office" really shines. 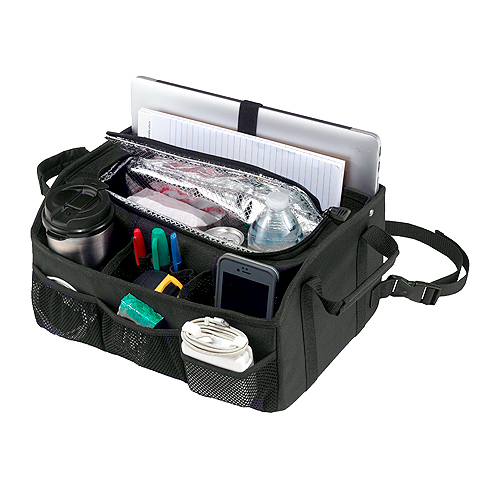 Keep all your favorite gear neatly organized, including food and beverages, documents, tablets and laptops (up to 15"), chargers, pens and other items. Exactly how you pack your stuff into the mobile office is up to you--hey, to each their own. But we know you'll be happy to set this thing in your passenger seat, strap it down and get back to work in an organized, professional manner. (3) Open compartments to hold cups, cell phone etc. 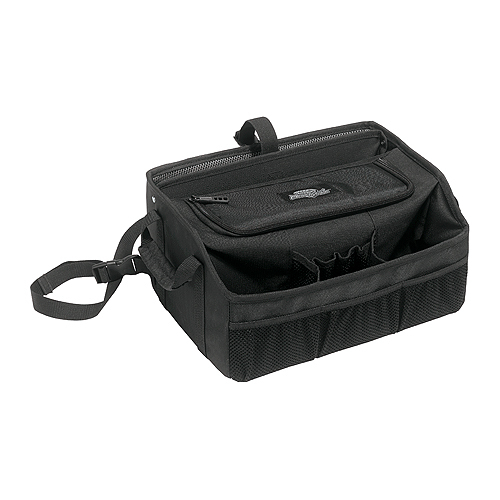 (3) Front mesh pockets to hold chargers, flash drives etc. It measures 14.5"L x 10"W x 7"H.
The thing works great. I bought it for my dump truck, it holds everything I need for my day to day jobs. The back section holds my record/maintenance, clip board and work order book, the the front center pocket has my pens phone and business cards. My truck doesn't have cup holders so I use my from right pocket as my cup holder. The cooler in the middle is big enough to hold 5 bottles of water and an ice pack. It's easy to put in and take out when needed. Merchant Response:Thanks for the thorough review Dave!